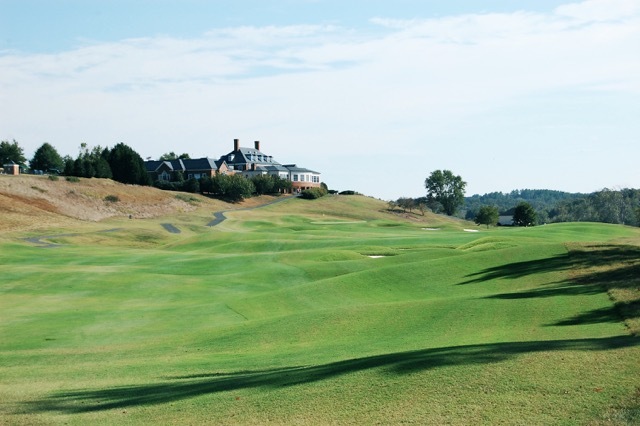 Charlottesville, VA, is one of the most underrated golf community markets for retirees. Perhaps a perception that a state just below the Mason-Dixon Line and not far from the Blue Ridge Mountains suffers through long, cold winters keeps us Yankee retirees from showing this impressive college town the love it deserves. In truth, those who live in the Charlottesville area put away the golf clubs in January and February but the weather generally cooperates in December and March and is nearly perfect the rest of the year. And in January and February, there are plenty of distracting events in a major college town like Charlottesville, home to the University of Virginia (UVA), including big-time college basketball, concerts and art exhibits. And the university’s adult education program is on a par with any in the nation. rest of the course, designed by Ellis Maples. Wintergreen is located an hour west of the city of Charlottesville. The community of Glenmore in Keswick, VA, is about 25 minutes to the east, on the way toward Richmond. The golf course, designed by John LaFoy, rises and falls along sweeping fairways through the community of indigenous, mostly brick homes set well above the funneled fairways. That provides great views from many backyards yet little intrusion on the field of play for golfers. Given the community’s Scottish name and landscaping, LaFoy’s layout could fit comfortably into parkland in the Old Sod. Few lots remain for sale at Glenmore, and current resale homes start around $500,000. Tom Pace is our agent contact for Glenmore (he and his family live there) as well as Keswick Estates (see below). round at the John LaFoy layout in Keswick, VA.
Just a couple of miles from Glenmore, Keswick Hall Golf Club, in the heart of Keswick Estate, has captured the attention of the luxury golf home market in the area for the last two years, ever since Pete Dye redid a decent but underachieving layout by the Arnold Palmer design firm. It is hard to think of Dye, given his reputation, having “softened” the hard edges on anyone’s layout, but he has been given strong credit for doing just that at Keswick Hall without diminishing the challenge. At completion, Keswick Estates will comprise just 121 homes, with lots priced today beginning at $290,000 and resale homes, big and beautiful, for sale starting above $1.2 million. 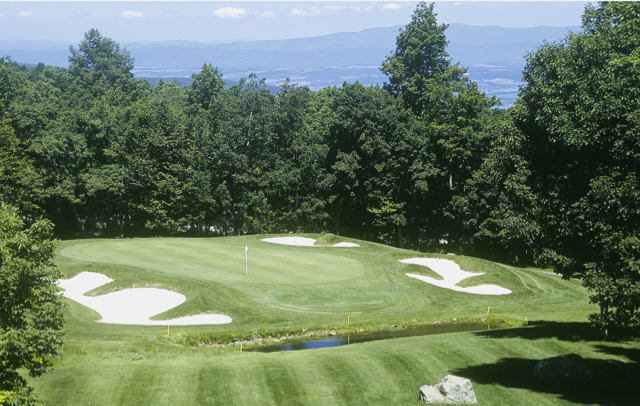 Other golf community options in the Charlottesville area include Old Trail in Crozet, just west of the city, with a mix of condos, town homes and estate homes at prices starting in the high $300s, and a golf course that is both reasonably priced (semi-private) and challenging. Farmington Golf Club is the staid old style club in the area, with a clubhouse designed by Thomas Jefferson and a golf course that has lots of classic touches. If you would like information on any of the Charlottesville golf communities or more information on the area itself, please contact me. Can Home-Free Golf Courses Last? Golf courses that thread their way through housing developments have always come under criticism from serious reviewers –- as well as many of the rest of us -- who see homes beside golf courses as polluting proper design and golf layout aesthetics. (Ignoring the fact, of course, that the Old Course Hotel and the beautiful but hulking clubhouse at the home of golf at St. Andrews are very much in sight, and not far at all from the field of play.) Suffice to say that many who join a club that does not suffer from home-site pollution do so because of the natural character of the golf course layout. More and more, such natural layouts may become relics as golf clubs continue to struggle in the post-recession economy. Some clubs that are blessed with a bit of extra land surrounding their golf courses are considering selling lots to developers in exchange for cash and, in some cases, the guarantee of additional members. I read recently about Greenacres Country Club in Lawrenceville, NJ, whose members decided to peel off 15 of the club’s total 140 acres and sell them to national builder Lennar. Lennar’s typical model for its golf communities in warm weather locations –- I have visited a few, including Heritage Bay outside Naples, FL -– is to “bundle” golf with the sale of the home, making it essentially free to join the attached golf club but making the paying of dues mandatory. In other words, you pay dues at least for a social membership until you sell your home at some future date to someone who will then pick up your obligation. The sale of the 15 acres at Greenacres will help fund a $5 million renovation of the golf course and the 78-year-old club’s clubhouse and pool (about 60% of the amount going toward the golf course redo). Noted designer Bobby Weed (five TPC courses, Hilton Head National, Ocean Links at Amelia Island) has been hired to totally renovate the golf course. Lennar will construct almost 100 town homes on what is currently the practice range area, which will be relocated, and should add more than 100 new dues-paying members to the 200 already on the Greenacres club rolls. The homes are being designated for people 55 and older. One of the nice features of my own golf course at Pawleys Plantation in South Carolina is that the finishing hole runs between marsh and pine forest before emerging onto an open fairway with a large pond to the left and woods continuing on the right. The only manmade structure in close proximity is the plantation style clubhouse directly behind the elongated green; the sweeping lawn and sloping back porch and stairs of the stark white structure add a dramatic backdrop to the approach shot and contrast to the green. But the relative purity of the hole will end in the coming year when construction begins on the first of a half dozen homes in the woods just over the cart path and within a lob wedge of the green. It will change the visual character of the hole; and although the real trouble on the hole -– the pond -- is tight on the left, I still will try not to look right. Cliffs community to feature new mixed-used space for public. Parish the Thought: Golf Course in Louisiana in financial trouble; town considers buying it. ...while another popular Naples community releases group of coach homes. Who says they aren’t building golf courses anymore? New Nicklaus course coming to Reunion Resort community in Florida. Canada’s Own Problems with Golf: Homes, apartments possible for Stanley Thompson 9-holer. Out of Bounds: Small town police chief does not want carts straying from fairways. Happy Trails: Retired Prof tells golf leaders how to build a golf trail a la Alabama’s Robert Trent Jones Golf Trail. Burn Baby Burn: British study says golfers can lose weight. Golf Community for the Birds: Oldfield scores Audubon designation. Roughly half of those who live inside the gates of golf communities rarely or never play golf. They buy a home in a golf community because of the generally more evolved landscaping associated with the golf course and because they believe their homes have a much better chance to retain their values if a beautiful amenity like a golf course is close by. In general, they are correct. But, ironically, some of the biggest battles inside golf communities are between golf club members and non-members in those communities where membership is not mandatory (most communities). Sometimes, such as during and after the 2008 recession, membership rolls in country clubs dip below the sustainable line; cutting back on expenses to keep the golf course in good condition can cause more member losses which, in turn, causes further cutbacks in conditioning. Feelings between golfer members and non-golfers can become uncomfortable when, to avoid the downward spiral, golf community clubs appeal to the homeowner’s association for contributions to capital budgets and for the costs of marketing to prospective new members. Once the member rolls return to proper levels, the club can sustain its necessary expenses from the added dues payments. But, in the meantime, non-club members often look on tiding the club over as throwing good money after bad; in other communities, thanks to professional communications from the club and homeowner boards, residents make the wise connection that the values of their homes are tied directly to the health of the golf club. Put Cypress Landing in the latter category. Over the last three years, the Chocowinity, NC, community of just under 600 homes has signed up more than 100 new residents thanks to a dramatic refurbishment of its web site, arrangements with five local real estate agencies to push properties for sale inside the community, an aggressive “ambassador” program that involves many of its residents, and an overwhelming recognition by residents that the value of their homes can rise and fall like the tides in the adjacent Pamlico River. Thanks to recent sales, the current inventory of unsold homes in the community is down to around 6%, a few percentage points lower than in most golf communities and a sign of a healthy real estate market; with fewer homes on the market, those that are listed have slightly higher selling prices than if there were a couple more dozen homes available. 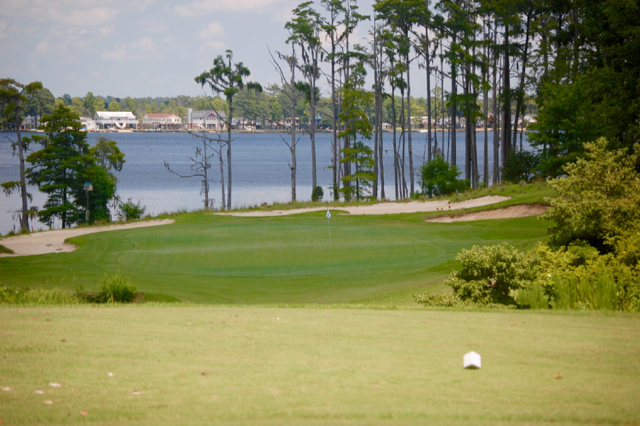 The par 3 15th hole at Cypress Landing backs up to the Pamlico River. 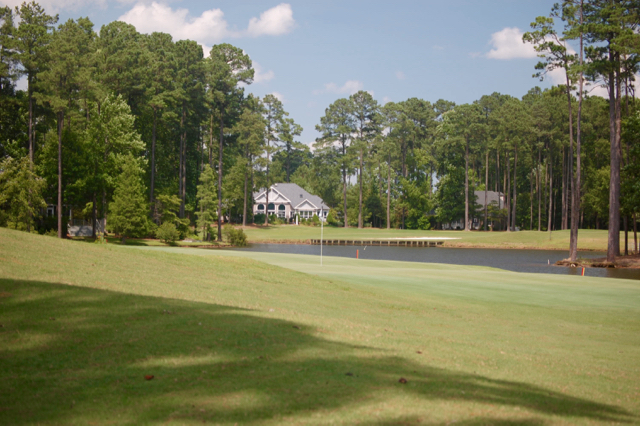 Cypress Landing’s board of directors maintains a strong marketing committee that has helped its fellow residents make the connection between their property values and a vibrant golf club. Those good feelings spill over to new prospects when they visit Cypress Landing on its reasonable Discovery Package, just $175 for three days and two nights. 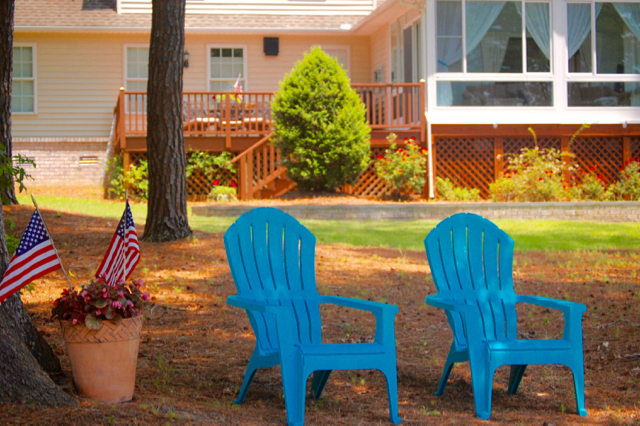 The Ambassadors are couples who live at Cypress Landing and are matched with prospects who have specific interests. For example, if a visiting couple is interested in golf, Grahek, who manages the Discovery Program in behalf of the board, will match them with a golfing couple for a round of golf. Boaters are matched for a river and bay tour with couples that keep a boat at the community’s 220-slip marina. Given that Cypress Landing offers dozens of amenities, activities and clubs, no visiting couple has to go without a local couple to guide them. I’ve served on a few marketing committees and I know that “creative” decisions evolve from often animated, occasionally contentious, discussions. On golf club boards, composed substantially of former business people, most members can act like marketing experts. But the Marketing Committee of the board at Cypress Landing actually includes five members with professional marketing experience, Jeff Gould told me. Recalling the old line about a camel being a horse designed by a committee, I asked him if “designing by committee” was an issue at Cypress Landing. Many of the homes at Cypress Landing have views of the golf course at only a modest premium over wood view lots. Whatever, it seems to be working. When I visited Cypress Landing for the first time in 2015 -– see article here –- I was struck by how well the community was laid out, with homes spaced well apart and the golf course nicely integrated into the landscape. The reasonable prices for most of the homes on the market belied the views of the wide and attractive Pamlico River and Chocowinity Bay and were comparably low for a community not that remote from an active town like Washington and a bustling small city like Greenville. In many cases, homes on the market today, despite the short supply, are priced at barely more than $100 per square foot. Cypress Landing, which has not maintained an on-site sales office since owners purchased the community in 2003 from original developer Weyerhauser, the giant paper company, has made arrangements with five local real estate brokerages to handle sales. 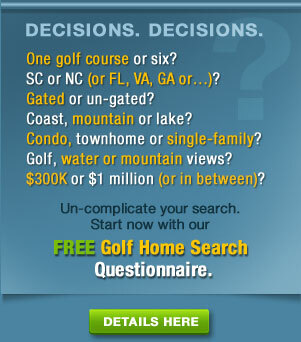 Unusually for a golf community, Cypress Landing’s web site (http://cypresslanding.com) lists a few homes for sale by owner, a nice little touch for residents looking to avoid the customary 6% commission rate, and for potential buyers looking for a better priced home, unburdened by thousands of dollars in real estate commissions. When I asked one of my favorite questions -– “What type of couple is not right for Cypress Landing?” -– Messrs. Grahek and Gould responded almost in unison, “recluses.” I get that a lot, but for a modestly sized community, it would be hard for any couple to hide at Cypress Landing given the several dozen activities and clubs on site, the town of Washington on the other side of the river, just 10 minutes away, and Greenville a half hour down the road, and home to Eastern Carolina University and a large medical complex with which any aging baby boomer aware of his or her mortality will identify. Given their success in marketing the community over the last three years, I asked Grahek and Gould what their next target was and they mentioned that 49 lots remain unsold in the community, all in private hands (some, no doubt, by residents who decided to make an ill-fated extra investment before the recession). The average lot price in Cypress Landing is $72,000, with water-view sites a little higher and plain wooded sites priced a little lower; many of the “average” lots have views of the Bill Love designed golf course. Since customary construction costs in the area run to about $135 per square foot, a couple looking to build their dream home to their own specifications could certainly do so at less than $400,000, land included, for a 2,500 square foot house. Given just $1,224 annually in homeowner association dues, a very reasonable $258 per month in golf club member dues per couple and no initiation fee, Cypress Landing is undeniably one of the better buys in comprehensive golf community living. The number of people relocating inside the U.S. fell to its lowest level ever in the last year, according to the latest U.S. Census Bureau data. The number was 11.2 percent. The South saw 901,000 people leave the region but welcomed 940,000 in the same time period. Florida remains the go-to state for most people moving from colder climates; the Sunshine State also saw a strong uptick in migration from the state of Texas (and Texas saw an almost equally strong inflow from California). See press release here. On the face of it, in-migration is a sign of an area’s economic health and a signal of a vibrant future. But retirees looking for a pleasant place to live out most of their remaining days should not judge an area solely by its popularity. Indeed, net inward migration might imply an area’s attractiveness but local town officials had better be savvy enough to prepare for more traffic, more burdens on infrastructure and, if young families are part of the equation, the need for more schools (and, potentially, higher taxes). The respected financial weekly, Barron’s magazine, published an article this past weekend about real estate markets in the U.S. that are undervalued. The implication is that those who live in those markets and are poised to beat a retreat to, say, a golf community in the Southeast might want to cool their jets for a couple of years. Homes in my own Hartford, CT, market, according to Barron’s, have an intrinsic value 10.73% higher than their current median price; in other words, between now and 2019, the average home in the Hartford market should rise by 11% or more. That ranks fourth on the Barron’s list. Two other Connecticut metro markets are second and third rated on the list, with the Allentown, PA, area listed at the top. Barron’s could be right on the money, but those who have a plan to relocate but are sitting tight in anticipation their current home will appreciate in value are playing a dangerous game for two main reasons: first, the home they may buy in a few years could very well appreciate at a faster rate and, second, any “loss” they suffer by selling too early will be more than made up by the cost of living expenses they save by moving. 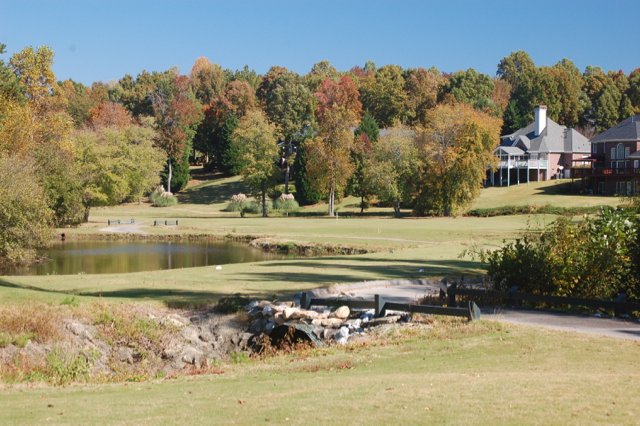 A resident of any of most Connecticut towns could purchase a home in Pebble Creek near Greenville, SC, and save thousands of dollars a year in expenses. There is no initiation fee for the 36-hole Pebble Creek Country Club and monthly dues are around $250 per month. Cost of living difference is an even more profound reason to consider acting sooner rather than later. According to the web site BestPlaces.net, which provides a helpful calculator to compare the costs of living in hundreds of cities and towns nationwide, Greenville is only 2% cheaper to live than in the city of Hartford. However, Greenville is a full 47% cheaper than my town of Avon, CT, 35% less than nearby Farmington, CT, and half that of the upscale Ridgefield, CT. Any increase in home values in these and most other Connecticut towns will never make up for the savings in cost of living by moving South. If you are considering a move South in the next couple of years, give us a shout –- click here –- and we will run the numbers for you and demonstrate it could be time to get a move on. From sea to shining sea, President-elect Donald J. Trump has his name emblazoned on the clubhouses and scorecards of a dozen golf courses in the U.S. By reputation, they are impeccably conditioned and provide member services that justify six-figure joining fees and thousands of dollars in annual dues. Importantly, because the fairways and greens must be mown and the post-round libations and meals must be served, the clubs provide jobs that are nominally good for the local economy. But a quick scan of the counties surrounding Trump National Golf Clubs shows that the candidate batted a mere .166, winning only one county, Iredell in North Carolina, by more than a percentage point; he squeaked by 48% to 47% in Dutchess County, NY, his only other victory in the vicinity of his clubs. The Bronx, NY provided one of the biggest margins in Secretary Clinton’s favor in any county in the U.S. One of the five boroughs of New York City, The Bronx was never going to go Trump’s way. In fact the Trump Golf Links at Ferry Point, built on a former landfill site just short of the Whitestone Bridge, might have provided an extra irritant to local voters. Trump takes credit for building the golf course, yet some New York City officials have been emphatic that the city built it and Trump was brought in solely to operate it. (Since the project was well over budget, the battle to claim responsibility seems odd.) Also, recent news articles indicate that work around the golf course, which opened in 2015, has still not been completed. Green fees on the Jack Nicklaus designed layout are pegged at $144 for city residents on weekdays and $172 on weekends, not exactly working class friendly. The rest of us pay $194 and $219 on weekdays and weekends, respectively. Five years ago, Trump purchased the financially distressed golf club in the community known as The Pointe on Lake Norman, north of Charlotte, NC, and installed his son Eric to manage it. Homes in The Pointe are valued from around $600,000 and up, which dovetails nicely with the Trump taste level and fee structure. Reports are that the Greg Norman golf course is in top-notch shape. Trump isn’t about to get a vote of confidence either in one location overseas. When his lack of international experience came into question during the campaign, Trump referred to the Miss Universe pageant he once ran and, later, to his golf clubs in Dubai and Scotland. He now owns the fine links at the classic Turnberry on the Scottish coast, but it is the modern course he built on the ocean near Aberdeen that has courted controversy. When the owner of an adjacent farm refused to sell his land to Trump, the President-elect built dunes so high along one of his fairways that they blocked the view of the ocean that generations of the farm’s occupants had enjoyed. The promised couple of thousand jobs at the resort have never materialized and some of the Scottish parliamentarians perceived as having greased the skids for environmental and other approvals have paid a political price. Most recently, Trump has sued a local energy company for placing wind turbines in the waters just off the coast, despoiling the view from the clubhouse and golf course. In the run up to the most contentious Presidential election in our lifetimes, I recently interviewed developers and residents in a few golf communities in Southeast. I asked if the fractious nature of the election season had spilled over into their clubhouses and onto their golf courses. I thought that with Yankees and native Southerners at such close quarters, the debates might have stretched the bounds of civility. But, no, my contacts said, all was quiet inside the gates of their golf communities. Undeterred, I took a look at the political preferences in counties that surround some of the most popular golf communities in the region. After all, one must occasionally venture outside the gates of the golf community for groceries, entertainment, doctor’s appointments and the like. It is tempting to assume that in the South, candidates running under the banner of the Democrat party probably don’t do very well, and that has been true for decades and remains true for most areas of the region. But some cracks began to appear when, in the 2008 election, President Obama pulled off a stunning victory in North Carolina, where he garnered 49.9% of the state's vote to Senator John McCain’s 49.5%. (Mitt Romney edged the President in the Tarheel State in 2012.) Virginia tilted blue in 2008 and has remained so, barely, in the two elections since. Statewide, though, South Carolina has been consistently red since the early 1960s, and although some polls added a tinge of purple to the predictions for the state in the 2016 election, Donald Trump triumphed decisively over Hillary Clinton in this past week’s voting. With the exception of Virginia, all the Southeastern states went for Trump. Obviously, no voting data is collected from inside the gates of golf communities, but there is plenty of accurate data for the surrounding counties. And for those who will care about the politics just outside the gates of where they live, here are selected results from golf communities in the Southeast for the 2016 Presidential election, followed by the names of golf communities in each county. Note that the results from Stephens County in Georgia, home to the beautiful Curahee Club, indicate that more than 8 in 10 county residents voted Republican, by far the most lopsided results we have seen.